The Jinyu YH12 195 65H15 is an all season tyre with safety and comfort at the forefront of it’s design. The unique tread pattern with added silica combine to provide excellent grip and handling in both wet and dry conditions. The Jinyu YH12 195 65H15 is an all season tyre with safety and comfort at the forefront of its design. The unique tread pattern with added silica combined to provide excellent grip and handling in both wet and dry conditions. 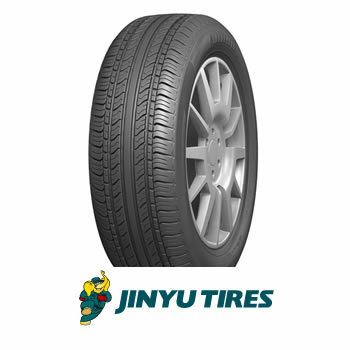 The Jinyu YH12 195 65H15 New Tyres is an all season tyre. These tyres arrive with safety and comfort at the forefront of its design. The unique tread pattern with added silica combines to provide excellent grip and handling in both wet and dry conditions. There is no doubt that these tyres by Jinyu are one of the best economy tyres in the market today. Jinyu makes an excellent range of steel belted radials to fit most SUV’s; 4X4 does not forget the regular car and van tyre sizes. Pellon Tyres, here in Halifax Yorkshire UK, have been selected as the Jinyu stockists for the Calderdale area. Pellon Tyres also offer a full range of Jinyu winter tyres at very competitive prices to suit all pockets. Jinyu YH12 195 65H15 New Tyres are made to pass all European tyre standards and have an excellent rolling resistance making the tyres environmentally friendly, in particular for an economy brand of tyre. Jinyu winter tyres are also of good quality and will stand up to any severe weather that is thrown their way. The Jinyu new Tyres are suitable for all models and make of car including 4X4’s and SUV’s. They come with the correct speed ratings and load ratings so that you can be confident that these tyres will replace your old tyres with the same standard and quality. We are so sure about the level of the Jinyu YH12 195 65H15 New Tyres products that we give a 6-month guarantee with every one of these tyres sold. The warranty also covers the Jinyu tyres against accidental damage in that period. So in the unlikely event that you cut or damage the tyre in any other way, within the six months period, we will replace the tyre free of charge. For any tyre advice telephone 01422-351314. We are there to help you.